What’s the best way to get your advertisement or content to go viral? Pair it with a timely pop culture reference or trend. While that might seem too easy, we can prove that it works. Have you ever heard of a little show called Game of Thrones? Lots of brands have been using Game of Thrones related themes in their advertisements, infographics, videos and social content and guess what? It’s getting lots of attention! The theme can be used any way you see fit, it’s the actual reference that aids in capturing attention and the audience’s emotions — not the application. Hootsuite — already well known for their Game of Thrones infographic — upped their game to produce another piece of themed content, a parody video of the show’s opening. Similar to the iconic intro of the show, the video displays structures rising from the ground, as the camera pans across a map. Each structure represents a specific social network, in contrast to how the family houses are represented in the Game of Thrones intro. Not only is Hootsuite’s video awesome, it’s highly shareable. You can’t help but feel the need to share it with other marketers and like-minded fans of the show. Homes.com did something similar, using their own strengths to create an engaging, and shareable medium. In Game of Homes, they setup an interactive map of Westeros and Essos — the fictional lands from the show and books. Thinking of moving to one of the realms? You’ll have a great time looking for a new home using their interactive map! Just remember, when you play the Game of Homes, you either rent or you buy. How about the Sesame Street parody, Game of Chairs? It’s a parody video that stars Sesame Street characters, who play a heated game of musical chairs to win the throne of Jesteros. Yes, the kingdom is called Jesteros. The most interesting thing to takeaway from this parody is how the Sesame Street team used lore from the show and books and delivered it in a quirky, kid-friendly skit. 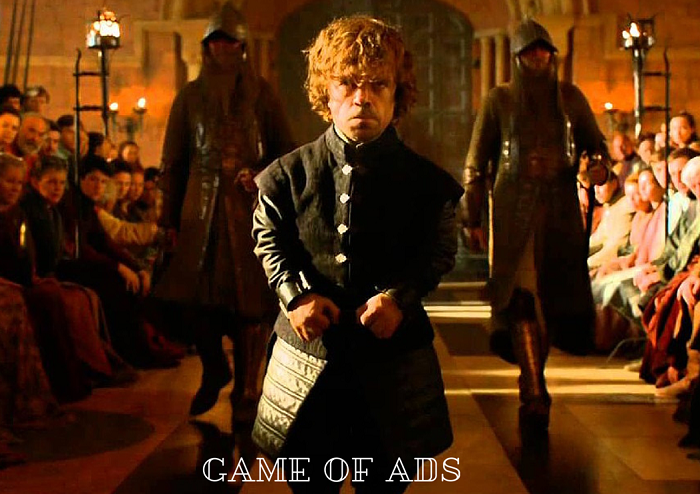 Obviously, Game of Thrones is for mature audiences only but that doesn’t mean your parody or ad has to be! Spoiler alert: Grover is in the video too! Here’s another parody video for you, this time coming from GetUp! Australia. The main idea behind this video is to explain how the Australian parliamentary voting system works. The catch, is that it’s explained with an overarching Game of Thrones theme. All of the different voting terms and parliamentary systems are explained with an interesting twist. I’ll bet you never believed you could have so much fun learning how a government works until you saw that video, did you? To date, the parody has been viewed more than 120,000 times, so it’s a definite success. What’s better than pairing your ad with a theme from one of the most popular TV shows out there? Pairing your ad with a theme from two of the most popular shows on TV. Quiznos did just that with their House of Thrones parody video that merges House of Cards with — you guessed it — Game of Thrones. This bad boy has been viewed over 2 million times. Talk about excellent product placement, Quiznos used YouTube’s annotation feature to promote several discount coupons to viewers. Of course, it doesn’t hurt that the video is hilarious. What ads or content pieces have you seen that use pop culture to get the target market’s attention and win their hearts..or should we say thrones? HAHAHA Well, your team definitely did a great job My pleasure, Grant!